Indoor grilled salmon is one of the favorite food items of the world. 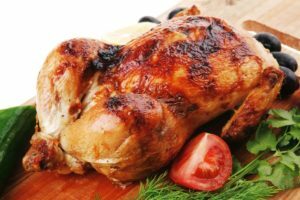 It is a healthy and perfect food item for them who likes grilled food. However, if you have not enough time for a charcoal grill, you can grill your salmon in indoor. Salmon contains omega-3 which helps to decrease the level of lipoproteins in the blood. However, an indoor grill is a good choice for a busy life. It is so easy and there are some good ways to have perfect flavor and also nutrition. 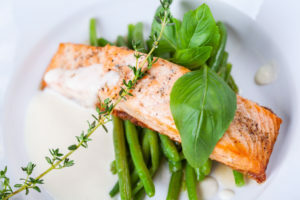 I will show you some easier way to enjoy proper and delicious grilled salmon. There are some indoor grilled salmon recipes. I am describing some of them. Read the full process carefully. It is an easy recipe and needs only 30 minutes. A better preparation is very much important to get the better taste. SO, you need to collect all the ingredients before cooking. Keep the salmon at room temperature for 20 minutes. Then preheat your oven to 45-degree F. Take a cast-iron grill and preheat it for 1 minute. Then brush the pieces with oil, season them with salt and black pepper. Now follow the direction to enjoy your indoor grilled salmon. Take an iron grill pan to cook your salmon. Hit it at medium temperature for about 6 minutes. Then coat the pan with oil such as olive oil. You need some other utensils to cook properly. They are the grill brush, brushing oil, spoons, etc. In order to get the accurate taste and flavor, you need them. Now it is time to cook. Take the salmon pieces and put them on the grill. But keep the skin side up and at angle cross of the pan. Then cook for 3 minutes until the fish pieces characteristic grill marks. To make the marks you can use a spatula to re-positions the pieces. Again cook them for 3 minutes to 5 minutes for medium and more than to well done. Then raise the heat to medium-high. Remove the pieces from pan and keep it for 2 minutes. Your indoor grilled salmon is ready to serve. Now I am describing the foreman grilled salmon. But this recipe is good for a regular grill. It is easy too. It is a popular recipe. Do not miss George Foreman Grill salmon. Now see the full process. Take a bowl which is non-reactive. On this bowl take some lemon juice, 1 tablespoon vegetable oil, salt, and pepper. Then whisk them together. Now add some salmons and coat them properly. Put the marinated salmons for a while. Pre-heat your Foreman grill. Keep all the pieces of salmon on the grill. Now cook it for 3 to 7 minutes. The time depends on the thickness of the salmon. It will take less time than a regular grill. So, it is better to check your salmon after 3 minutes. When you see that it flacks easily when you poke it with a fork, it is done. It is not a hard recipe. You need just remove the backbone of salmon and then grill it. 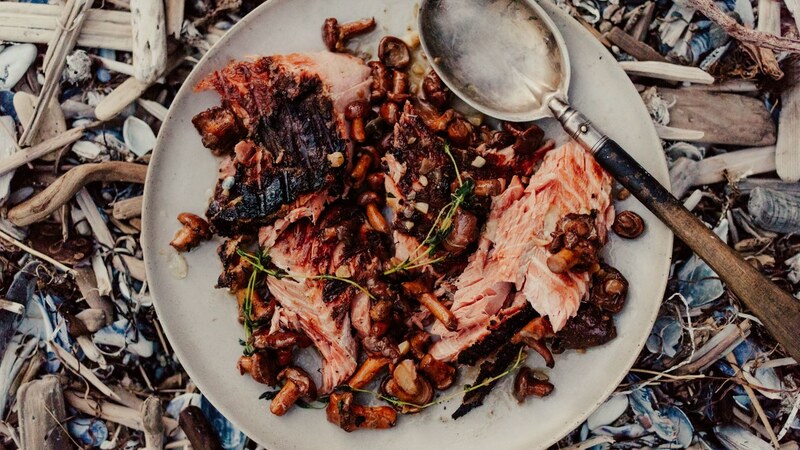 The recipe is called the whole salmon grilled with Chanterelles. Let us see the recipe. Let us see the preparation of chanterelles and salmon. At first, heat a cast iron at high-medium temperature. Then add some butter and some oil to the pan and swirl until it melts. Now add some mushrooms, garlic cloves, salt, pepper, etc. Cook them by tossing until they become golden brown. It will take 4 to 7 minutes. Take an iron grill and heat it at medium temperature. By using a knife, cut the sides of the Salmon and take the backbone out from it. However, do not tear the skin of the fish. Then season the inside part of the fish with salt, pepper and stuff it with lemon slices, thyme, dill. Now place it on a baking sheet and rub the skin with oil. Then place the Salmon on the grill. Cook it for 10 minutes. Now remove the back skin of the salmon. Then break the fish into pieces and keep them on a plate. At last, cover the pieces with chanterelles and season it with some salt and black pepper. Your grilled salmon is almost ready. Indoor grilled food is very much favorable for the people in summer. To do any grill, you need to choose the best grill pan. George Foreman grill, electric grill, stove top grill pan are the best. To get delicious grilled fish, the cutting of the fish is an important matter. It is better to cut them around 3 to 4 inches. Besides, use simple seasoning salts and other ingredients. Moreover, marinated fish will be kept for 20 minutes and it is better to keep them in a refrigerator. In order to get the actual grilled flavor, keep your grill pan clean and use some oil while cleaning. 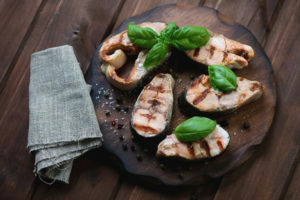 I think, all the three recipes of indoor grilled salmon will help you to enjoy grilled salmon at home. Try them at home and give a surprise to your family members. However, they will enjoy it very much.